I wonder if you ever found yourself in a situation which, while being funny, left you pretty much shaken and gasping for air. Well, I managed to find myself in one such situation last weekend. As my younger brother was visiting home after six months we all were really excited. And to top it, his short trip to home included his birthday as well. So, Mom, Dad and me decided to throw a small party on the occasion. So, on the given date and time, my brother, my cousin and I reached the party hall before the scheduled time to check if everything was in order. Other family members followed us in due course of time. We were sitting there waiting for the guests when I saw my eccentric friend trying to find his way in through the glass door. Once he discovered which way the door opened, he came straight towards us with a strange expression on his face. “Huh ?? ?” I questioned him. “When I asked about the way to the hall, the guy at the reception told me about the birthday party. 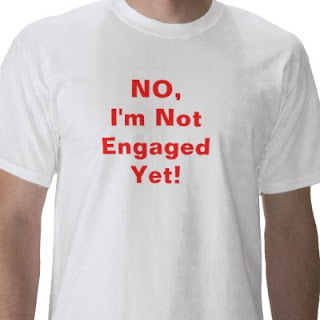 Darn… I thought it was your engagement !! !” He complained. We all burst into laughter while the expression on his face changed to a more disappointed look. I introduced him to some snacks which took his mind off his silly thoughts and brought an expectant smile on his face. “Many congratulations ! I have been waiting for this day since so long…” He exclaimed. “No no. Uncle, it’s Chicks’…” I tried to intervene. “I’m always right. I told your mom that you’ll be getting married within a year. Ask her if you don’t believe me.” His smile had turned to a big grin. “You what… ? ?” I suddenly realized what he was getting on to. “Uncle, it’s Chicks’ birthday. Not my engagement !” I informed him trying to force a smile on my face. His mouth was still open when he got this bit of news from me. It remained open except that no more sound emerged from it now. “There he is.” I pointed out to my brother and turned towards my friends, saving him (and probably myself) any more embarrassment. “What girl ?? ?” I snapped back. “You’ll never change. I’ll have to ask your mom.” She suddenly spotted my Mom and walked away to meet her ignoring me as if I was the last person on the earth she wanted to talk to at the moment. I now wondered whether it would have been better to let everyone know about the occasion of the party. I could feel myself fuming from the ears. And I’m pretty much sure that the changing colors of my face would have given me away if the hall was a bit brightly lit. As the crowd kept getting bigger, every third person would walk up to me to congratulate me and bless the ‘girl’… whoever she was. And I was getting paranoid by the passing second. It had got to such a point where my thinking brain started getting suspicious. Once long ago, I had read in a mystery novel, where a secret agent is taught by his tutors that there is no such thing as co-incidence. If you keep bumping into the same person or same situations, better run for your life. I now assessed the possibilities of a conspiracy. As I had already made it clear in the past to all of my extended family that they would be left with an absconding boy if they ever tried to force me into an arranged marriage, this would be an ideal trap by them to nail me. And by now I was concentrating on each group of guests that entered. I had already assessed the best routes of escape if I spotted a bunch of strangers entering the hall accompanying a young girl. My senses were on high alert, ready for action at the required moment. My already tensed mind was suddenly disturbed by my Dad’s booming voice which announced to the guests the occasion of my brother’s birthday and invited them to the cake-cutting ceremony. On a reflex, I sighed a sigh of relief and wiped the sweat on my forehead as I went to find a glass of chilled water. “Oh you know how hot it is today… ?” I said in a serious tone. “Yes. So hot.” He agreed. “You see that swimming pool down there… ?” I pointed to the north-east direction. “Yes.” He replied straining his neck towards the direction I had pointed. “Well… she was feeling too hot. So she decided to cool off in the pool till all the guests have arrived.” I said and moved on. A case of almost there!! :D Yes. It was pretty freaky. You bet I'm always ready in case things turn dangerous. :P Thanks for reading. lol. i like d reply at d end! Ha ha ha.... This was so funny... I have to agree that you have got a whole bunch of eccentric relatives around..
:D You bet I have. No I never met him :P Mom had warned me na... I din go at all... I am lucky that mom supported me..
Also there was a time when i was committed to Sunil but my family din know about it.. My Jiju introduced me to his aunt and uncle.. they were willing to help me get a job.. i spoke to them politely.. after they went the other way, mom told me that they have a son and they are searching for a prospective bride.. But I was not supposed to get married for another year(Actually this horoscope thing saved me a lot of funny incidents).. So my mom told them the same thing.. I won't say they were acting funny or anything.. They were sophisticated people.. within 6 months my parents announced I am getting married to Sunil.. And my Jiju was like 'I knew you were chupa rustam'..
Oh my God! Really! Your relatives must be pretty frustrated by your procrastinated relationship status...or may be they didn't attend a wedding party for a looonggg time and waiting for it holding their breaths! Hahaha. I don't know whether they are frustrated because of my relationship status or whether they are unable to have their share in the match-making process.